Legal Smoking Age to 21? Now, in February of 2016, after a long debate lasting 2 days, the Vermont House decided to pass a bill to raise the legal smoking age to 21. But the bill still isn’t law. “It would first need to pass the State Senate, which seems unlikely this late in the legislative session. Furthermore, the Governor would need to agree to sign the bill into law for it to take effect,” said Vermont Speaker of the House Shap Smith. Most students at U-32 thought the legal smoking age should not be raised. “I don’t think it really matters because people will still be able to get it just like they get alcohol,” said U-32 senior Jacob Toro. “I don’t think it should be raised to 21, I don’t even think the drinking age should be 21 just because it creates more angst to do it by saying it’s not allowed. I think that by the time you are a legal adult you should be able to choose what you want to put in your body,” said U-32 Senior Asa Maas. But there were students who support the proposed change. “My opinion is the legal smoking age should be raised to 21 because smoking tobacco in general is not good,” said U-32 senior Jade McMillan. Students who are already legal to smoke would stay of legal age as the law is phased in. “Really I don’t care because I am 18 so it doesn’t affect me,” said U-32 senior Simon Bradley. 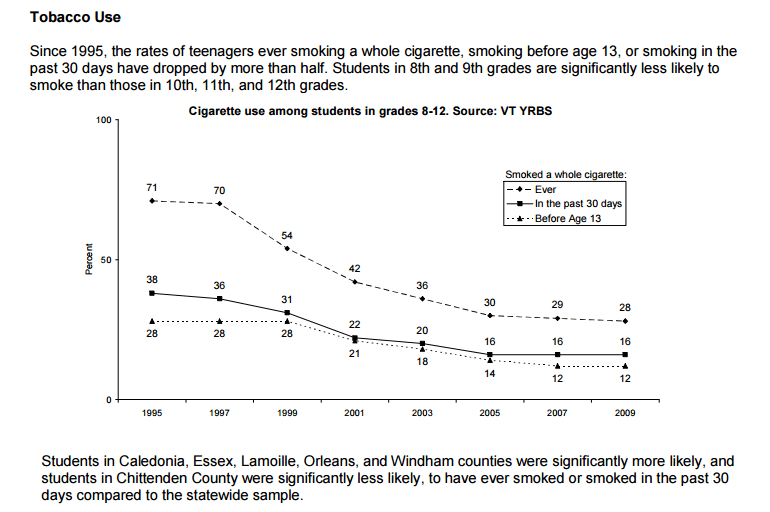 The main argument was for raising the legal smoking age is health problems from cigarettes. “There were a number of reasons why the bill garnered enough support in the House to move forward. Many Representatives supported it on the basis that it would protect young Vermonters’ health,” Smith said. “It was noted that tobacco use is a leading cause of preventable death, but hundreds of Vermonters still die each year from tobacco-related diseases such as asthma, heart disease, cancer, lung disease and stroke to name a few. Students understand the health risks. “Tobacco is terrible for people and is extremely addicting,” Simon Bradley said. “Health effects are the main reason why the smoking age should be moved to 21 because it has been proven statistically as well scientifically that smoking is bad,” said McMillan. On the other side of the controversy is the arguments to not raise the smoking age. These arguments are based on the laws and rights of the American people. Perhaps the strongest argument is that if an 18 year old is old enough to sign up for the military then they should be allowed to smoke. “Representatives defended the right of young adults to make choices (even unhealthy choices) for themselves. The Representatives opposed to the original version of this bill raised the disparity between denying a young adult’s ability to purchase tobacco products, while at the same age enabling them to enlist in the army. This led to an amendment in the current bill that enables servicemen and women to purchase tobacco products upon presentation of a military I.D.,” said Smith. The bill may be shelved for another year, or we could end up with a law that allows young soldiers to smoke but no one else.